Yeah...I know this isn't technically Corvette related, other than it being where the Vette is parked every night, but I was wondering if anyone had any recommendations on garage door openers? Haven't really dug in and started researching any of them yet, so I thought I would toss it out there for ideas. I have a fairly standard two-car garage with full-width garage door, and it appears my opener has finally bit the dust. (It was a fairly cheap opener that came with the house when it was built). I've thought about adding a 4-post lift someday, but the ceiling height would be pretty tight...any thoughts on an opener that might help save space in in that respect would be cool, if there is such a thing. If you're wanting to preserve vertical space, check out Jack Shaft openers. They mount at the end of the spring roll and mount to the wall. I don't have any good pics but look at the bottom of this page there is a pic that should give you an idea. You can probably find better pics by searching around. You could get a roll up door then you don't have over head rails etc. Expensive option but you work with what you have. I have Genie openers on both my garages - house and detached - and am very satisfied with them. They are screw drive. FWIW. . . I agree with Rick T and TR-6060, get a jackshaft opener. Nice garage! Well, if it is just the opener that is your concern, you can just buy another cheap opener. You have a basic two car garage, the opener itself will not hinder your lift as it will be beside the car on the lift. Here is an older photo I made up for a member when I had my C5 Z06. Now if your talking height of the door, then you either have to angle the rear of the door up (cheap) or add a panel and get one of those other type of openers that have been suggested. I just bought opener number one for my new 'man-cave'. My shop has roll-up doors. I used liftmasters....they make nice remote units with heavy duty motors for roll-ups. (much different froma garage 'track' door.) They have great warranties as well. I have had this set up for 4 years and would not go back to the Genie style. The wall mounts do not have the track in the middle of the ceiling so there is no chance of grease crap getting on your ride. Another plus is you can add a dead bolt lock that automatically bolts when the door goes down. I like the looks of those Liftmaster Jackshaft setups! WOW, I can't believe you got 2 corvettes on and below that lift. That is a tight fit. 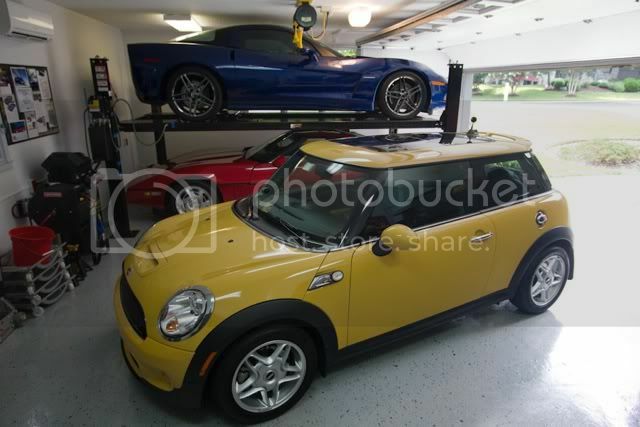 I wish I could fit a lift in my little townhouse garage. I concur, get the Liftmaster jackshaft opener. Besides the clean look to the garage it is super quiet and extremely efficient. I think what I like the most is the automatic deadbolt lock. The Liftmaster Jackshft only works with torsion spring garage doors. Any suggestions for a side mount opener if I *don't* have a torsion spring? Very nice setup...basically the same thing I'd like to do at some point. (except with a C3 someday). Do you mind if I ask your ceiling height?